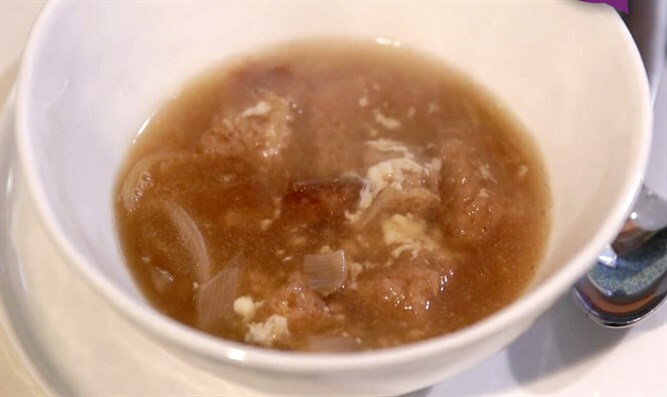 Even for those who are not usually an onion soup fan will enjoy the perfect texture and flavor. Melt butter in a four to five-quart pot. Add onions and garlic and sauté over low heat (this is crucial) until golden, about 25–30 minutes, stirring constantly. Turn up the heat for the last five minutes. Add flour and mix in well. Add seven to eight cups of water (depending on how thick you like your soup) and bring to a boil. Add onion soup mix, salt, pepper, and nutmeg, and cook for 40 minutes. Add mushrooms, if desired, five minutes before the end. Add wine and stir. For a special occasion, serve in bread bowls. Soup can be frozen. I almost never use canned mushrooms. Here, I used them for convenience and to add more texture to the soup. The flavor isn’t prominent.